Home Walk programme Past walk photos & videos About us Looking after your hound Funny pictures Links Contact us Start your own group? Want to lead a walk? If you want to organise a walk in your area, please let me know and I'll put it up on this site. Criteria: 5+ miles, with some woods or open moorland for a good run and ideally finish near a pub or café. Video of our last walk (+ Bloodhound) at Alfred's Tower - our 116th - see here. Melody plays with new puppy Harmony see here. (For 12 days Melody has ignored and acted aggressively to her new arrival, till Harmony woke up in her cage and Melody started baying, as if to say "C'mon Dad, she needs you." I let them out and here's the result. In 45 years of owning Bassets I found this about the most endearing and emotional moment). I bet my Basset bays louder than yours. See Melody here when the phone rings. If you like walking your Basset Hound as well or instead of showing, then come along to our next walk shown below. Due to the prognosis of our much loved Melody, see right, I shall be arranging walks on a month by month basis. However I do hope others will want to keep the group going so please let me know of walks you wish to lead and I will gladly post them up here as usual. Those who came on the memorable walk in the snow last year at Thurlbear will remember Bettina bringing her magnificent Albert and Albrecht all the way from Deutschland. Well we've kept in touch and she has just sent this lovely pic of eight puppies just 18 days old. Father came 2nd in class at Crufts. If they grow up anything like the brothers they will be superb. 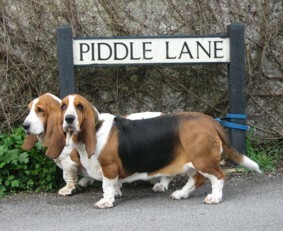 If you've ever been told "what nice beagles" click here for a suitable riposte. Our Melody now just five years old, was off colour before Christmas but it took several vet visits to discover that her high temperature - 40ºC and very high white blood cell count - was due to an infected spleen. She had an op last Thursday but sadly was found to have growths on her liver and is only given months to live. The vet said she would recover to her old self but would then decline. 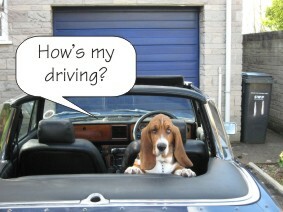 We've had Bassets for 45 years, but we can assure you it doesn't get any easier when you're told bad news. We've been blessed with some wonderful hounds - she's the eighth - but Melody has had a special place in our hearts as being the most affectionate and endearing. She must have been photographed dozens of times often by complete strangers. We know the only cure is to find another puppy - we still have Matilda at 14+ and get over it, but in the meantime I regret the Burnham walk on Feb 3rd will be my last for a while. However I would be delighted if others wish to lead walks: just send me details and I'll post them up here as usual. Lynda and I are most grateful for so many kind and thoughtful emails that we've received, so I know you understand. PS: Matilda died today 15th March - at 14 yrs 6 months - the oldest Basset we've ever owned and the last of the original hounds who started our walks nearly 12 years ago. We miss her terribly. We hate putting our hounds in kennels so we're delighted to find someone who will look after them in their own home. Situated just outside Langport in Somerset, the place is called "Cuddles", (see YouTube)which says it all really. When we left ours there were six other dogs, all running round, sleeping together, they had a grand time. The owners have a very large field and they also get taken for walks. Price is a very reasonable £17 a night, you supply the food. Book with Janice Board here. She said "when we get the new sofa we're NOT having dogs on it", she said. Photos of all our past walks and videos for most (don't miss the chaotic video) at Barbary Castle can be found here. 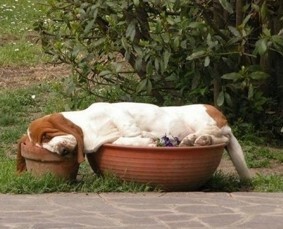 Basset Hounds are different. They may look cute (6 stone, cute?) in slipper ads, but as every owner knows they are just as likely to be obstinate, stubborn, wilful and natural thieves. We call it intelligence. 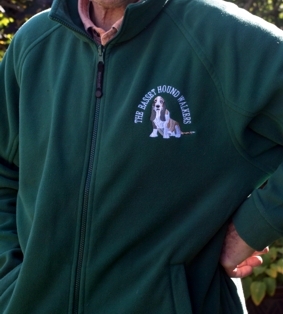 Since 1954 the Basset Hound Club has looked after standards, run championships, institutes a Code of Ethics, in short everything to do with the well-being of The Breed. Disappointingly they have shown no interest in what we are doing and refuse to publicise our walks. Anyone know why? It is our experience that most members are only interested in showing – fine – but some of us prefer to walk our hounds in company with others, for the sheer joy of watching a large group of bassets run together. 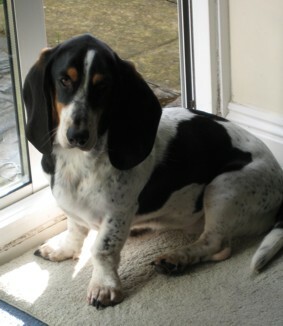 When we acquired our first hound, nearly forty years ago, there were six Basset packs, today I am told there are nine – the most well-known of which is The Albany, in the East Midlands. (Three packs are privately owned.) While we don't agree with hunting, it is still a fine sight to see such a large number in the countryside. 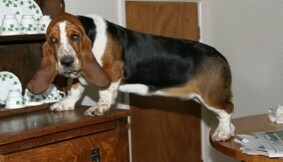 Compared to the average pet hound, The English Hunt Basset Hound is much longer legged and shorter eared, and certainly fit – some days they will cover 25 miles. With this end in view the Basset Hound Walkers (got the fleece?) has been formed as a very loose group of friends who will meet usually the first Sunday in the month to exercise their hounds. There is no fee, no constitution and certainly no officers. All are welcome (tell your Basset friends). Just bring some lunch and Bonios. So which is the most peculiar animal here then? 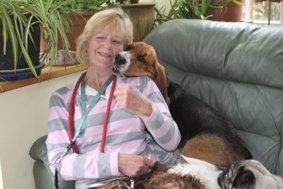 Just a quick note to thank you for your Basset Hound Walkers website. I wanted to get a basset hound for years and after doing our research we adopted Plunkett two weeks ago. We found your website extremely helpful and my boyfriend has made a little ramp for him to get down the steep step out to our back garden, inspired by the one on your website. "Hi. Thank you for posting the videos on YouTube. My husband and I love bassets. We had two in the past. Maybe we will get another one soon. I am disabled - rheumatoid arthritis. Hiking is impossible for me. But, as I watch your walks, I feel a part of the group. Beautiful hounds and beautiful scenery. I never saw so many bassets at one time. It is lovely. I chuckle as the bassets roll in the fields, or as they run in their group. Howling is such a sweet song to my ears. Thanks again for sharing your basset walks. Sincerely, Debbie Eidle, USA. 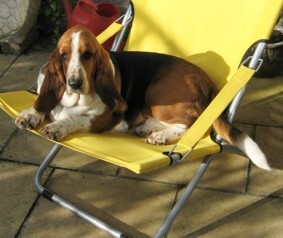 "I live in Ipswich in Suffolk and have been searching Google to find a walk to join with my lemon basset Reggie. I've come across your website and think it's fantastic! The only problem is I think it's a bit too far for us to come... Would you happen to know of other groups like yours nearer my area? Anywhere in Suffolk, East Anglia. If all else fails then I might have to make a special trip in the New year to come on a walk near you." I live near Toronto, Canada - or else I'd join your group in a heartbeat! "Me and my hubby .... would love to come on a walk with you all if you do one near here then someone can convince him that we do in fact need another basset to live with us, maybe a lovely girly for bert. I hope you will meet him soon on a ramble and then you can all help me find him later in the day"
Names deleted to preserve marital harmony. "I’ve been looking at your website and the pictures of your walks are fantastic !! 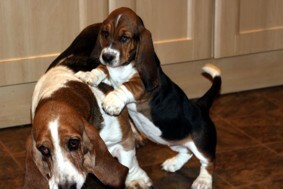 Looks like everyone has great fun and it’s such a joy to see all the bassets together." I have not smiled that much in a long time seeing the pack romping through the grass. The highlight for us was the Labrador being pursued by a large pack of Bassets baying. My side still hurts now from laughing. I think that next time we will bring the beagle and let the pack run after him instead of the lab as that will be one way to wear him out! If you've lost a favourite hound, click here to read Leslie Thomas' obit of Furlong, "the greatest dog in the world is dead". Warning: keep a tissue handy. Samantha Yarwood sent me this photo but I was in two minds whether to put it up. If your hound sees it, what on earth will it think? "Aren't I supposed to chase these things? What's this hound doing? 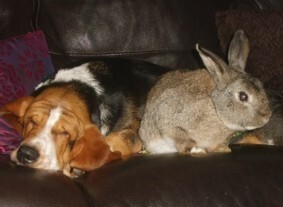 We both may have long ears but surely it's not a Basset?" Anyway send me your caption and I'll award a small prize (Teach Yourself Hunting?) to the best one, to be passed on at our next walk. Of course they didn't (Cerne Abbas). This walking lark is too much for me. "Can I bury your socks first?" Blocked footpath? Send for Miss Moppet. Last summer July 7th, I led a Ramblers walk to Tollard Royal - a walk that the Basset Walkers have done - past Madonna's old house, now with Guy Ritchie and his new family. While enjoying a drink at the posh King John, he turned up en famille. My walking friends did a swift exit embarrassed that I might act as paparazzi, but no, I just casually loitered, with Melody in close attendance. All I can claim is that my Melody rubbed noses with Madonna's ex husband's spaniel. Does that make me famous? When you've read the story here - thanks Becky for passing it on - ponder, would it have been the same if the roles had been reversed? 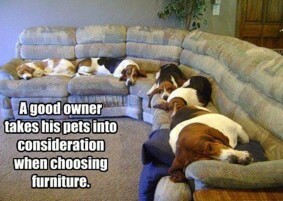 In 40 years of owning Bassets I have had many strange requests but none like we received in last summer. 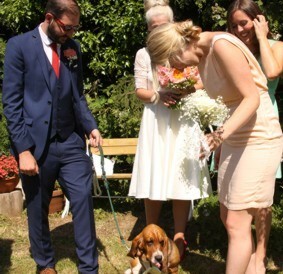 "I am getting married in three weeks time and my girlfriend grew up with Bassets and is in absolute awe every time she sees one. Do you know anyone in N Somerset who might be able to come along after the wedding for the photography bit? It will be a secret from her." So we did. Fortunately the groom had to swiftly explain that Melody was on hire, not a wedding present . . . It has taken 28 days for my 9 year old Matilda to bond with our 11 week old Melody. See them play here. (Keep a box of tissues handy). Now we can reveal . . . who was the very first Fred Basset, the cartoon which first appeared in the Daily Mail on 8 July 1963. Michael Webber writes: "A few weeks ago we went to Germany for a few days so we took our two to a friend who lives on a farm and also has three bassets. 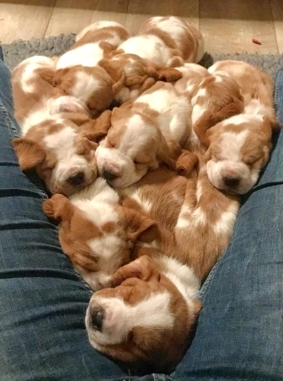 They always have a sausage to go to bed with and not wanting our friends three to be left out I took 28 sausages with me (5 bassets x 5 days plus 3 spare). About a mile from our destination I had to brake hard and the bag fell over in the back. In that one mile Margot managed to eat all 28 sausages.They were quite large sausages. Same size as a normal pork sausage but they were dried. We were worried all the time we were in Germany that she would be ill but when we returned our friends said apart from a very fat stomach for a couple of days she had been fine." 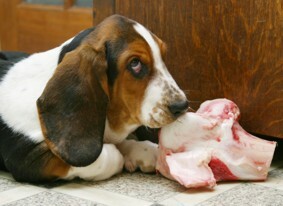 Are Basset Hounds good with children? Click here to see a 1 minute video of my grandson biting my Matilda. 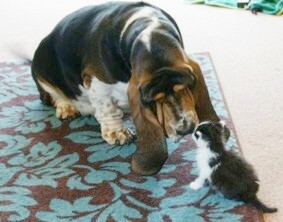 "I just wanted to say hello as a fellow Basset Hound owner. I've just stumbled across your website and have spent an hour giggling, agreeing and 'awww-ing' - it's fantastic! Unfortunately we're in London so won't be able join you on your walks but we have met the Albany Hunt at the Hertfordshire Show, so walks with them are on the cards. Our two Bassets are brother and sister, Lester & Lettuce . They came from the Switherland Kennel in Newark in Nottinghamshire and were part of a litter of 6. The Switherland Kennel are show dogs and we got the 'rejects' as didn't have the correct look! They'll be 8 in January and have had a busy life with us moving from place to place - they even spent 2 years in Antigua with us when we moved out there to work! " "I saw your website and think it's a fantastic thing you are doing. I am in Germany. My husband is stationed here with the US Army. 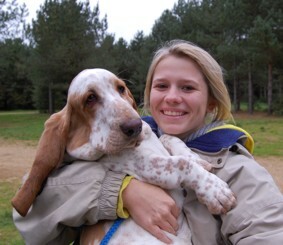 We have a 5 month old Basset Hound with a ton of energy and would love to come to one of your events. The one on September 2nd is the day before my birthday and am looking into attending." Christine. 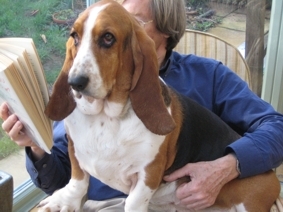 "I am writing to thank you for making and posting your wonderful Basset walk videos. 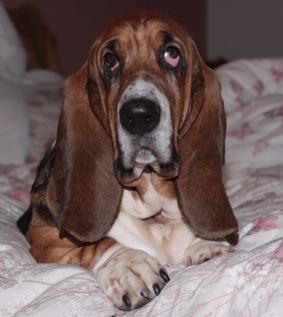 Three weeks ago, my adored Basset, Maggie, died after a long battle with cancer. Watching your videos of the hounds frolicking about the countryside has been a great comfort to me and my family. It had been a long time since my Maggie had been up to a walk. Thanks so much for sharing these delightful videos with the world. Best wishes to both of you and please give my regards to Matilda and Moppet,"
I stumbled per chance on your website. What a nice surprise ! 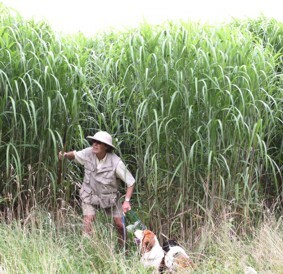 We live in the country and our nearest big centre is Cape Town, some 250km away, so the opportunity to meet with other basset owners are a bit slim. I am now almost 60 years of age. 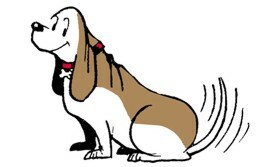 My first basset adopted me when I was a kid of 12 years old. My mother always made me marmite sandwiches to take to school. At one stage I was really fed up with the marmite. So, this funny low-slung, lean, clean and mean looking dog followed me on the playground, and I fed him the sandwiches. After the break the dog followed me back to the class. The teacher told me to take my dog out, and I said its not my dog. So the teacher tried to chase the dog out, and the dog wanted to bite him. After school the dog followed me home and stayed with us for about seven years before he died of old age. 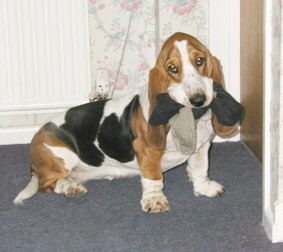 That was my first basset, and we had bassets ever since. 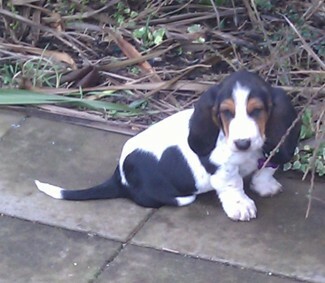 It's not obligatory to call your new Basset Fred - or as I tell people when they hear me call out Moppet, or Matilda "You're not alllowed to own a Basset unless you give them silly names". To solve the problem click here to see a list of traditional English Basset names, culled from George Johnston's excellent book The Basset Hound, pub 1974 but I see s/h copies still available from Amazon. There are some glorious names here, that just roll off the tongue: Quickaway and Chanter, Jealousy and Joyful: go on, be brave. 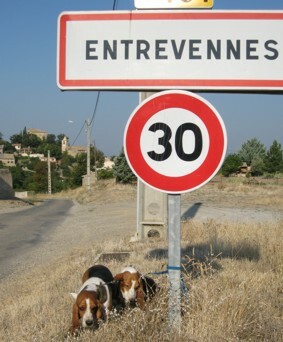 Taking your hound abroad? Click here for how to do it (and what to avoid).